Following on from the incredible Anthems To Decrepitude comes this five song EP, Inferno. I had high hopes for this latest release from Spanish solo black metal Hrizg as the last album has firmly cemented itself as one of my favorite black metal releases of 2011. However, galling as it is to say; I am disappointed. I don't mean to imply that this is a bad album, per se, it has its moments and is certainly listenable throughout. However, whereas on his previous work Hrizg has taken the blueprint of the first and second wave Scandinavian bands and created something truly memorable, this mini album leaves very little impression at all upon the listener. I have listened to this release a number of times now and still not one song really sticks in my mind. There's really not much else to be said. This isn't a bad album, just very typical of what a myriad other bands are doing. Firmly entrenched in old school black metal aesthetics, one-man black metal project Hrizg – which means 'hate' in Orcish – has released an album that is full of songs that would not seem amiss on an early Satyricon record. That being said, I do not wish to imply that this is a carbon copy of the Norwegian band as it is not, merely that the style is similar enough to be familiar. 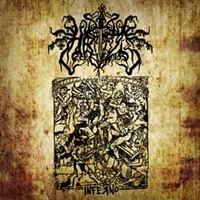 Hrizg's second full-length is very close to what I would consider black metal at its best. The focus is on the dark and sinister atmosphere without being kitsch or descending into pointless atmospherics. In comparison to the myriad bands out there who seem to think a billion blast beats make a good song (and not that I have anything against a good head-pounding!) the songs on Anthems To Decrepitude are all finely crafted pieces of music. Each and every one holds your attention and never gets boring. The Norwegian influence is highly noticeable with various songs showing traces of the aforementioned Satyricon as well as Taake. For many people the biggest factor in whether or not they like a black metal album is the production. This album is rough but this fits the atmosphere of the album rather than detracting from the musicianship. It doesn't sound like it was recorded on a tape recorder in an outhouse toilet and the guitars, rough as they are, still retain a good bite and lead the music. 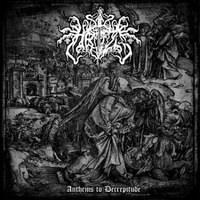 Although not entirely original in approach, Anthems To Decrepitude is an album that will certainly appease old school black metal purists and may even make them realize that good music does exist post-1995. For myself I would consider this one of the best new black metal albums in quite some time.